The United States Congress designated the Siskiyou Wilderness (map) in 1984 and it now has a total of 179,847 acres. All of this wilderness is located in California and is managed by the Forest Service. 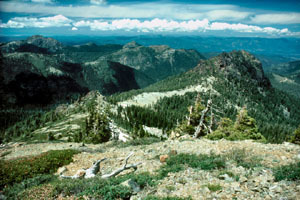 Forested ridges and craggy peaks with lower slopes densely covered with brush generally describes Siskiyou Wilderness. You'll also discover fragile mountain meadows, open glades, shallow lakes, and the Wild and Scenic South Fork of the Smith River, which forms a large portion of the western boundary. Clear Creek and the headwaters of the East Fork of the Illinois River flow perennially through the Wilderness. Summer populations of steelhead attract anglers. The area is noted for its great diversity of plant life, and includes one of the world's largest concentrations of lily species and perhaps as many as 20 species of conifers. Here grows the rare Brewers spruce (the "weeping" spruce). Forage is limited, and stock users are advised to carry feed. Summers are usually very warm, but cold can strike any night of the year and severe storms are common year-round. The Clear Creek National Recreation Trail crosses 20.5 miles of the northern portion and provides access to some of the more scenic parts of the Wilderness. Human use is light and concentrated on the trails that lead to lakes. Much of the area lacks trails and is difficult to access cross-country because of the dense brush. Many authorities on the subject suspect Bigfoot could be hiding out in the untrammeled regions. Planning to Visit the Siskiyou Wilderness? How to follow the seven standard Leave No Trace principles differs in different parts of the country (desert vs. Rocky Mountains). Click on any of the principles listed below to learn more about how they apply in the Siskiyou Wilderness.